RGB Matrix displays are a great way adding interactions to a project and displaying objects in a 2D space. RGB LED matrices can be used as a display for playing games, display animations, watch movies, display sensor data, and much more can be the done with these big and beautiful LED displays. Of course, RGB Matric display is best controlled with a high-speed processor like FPGA, but you can still use the Raspberry Pi to control them also. Most of the things (if not everything) the Raspberry Pi can output to a monitor can be displayed on LED matrices display. 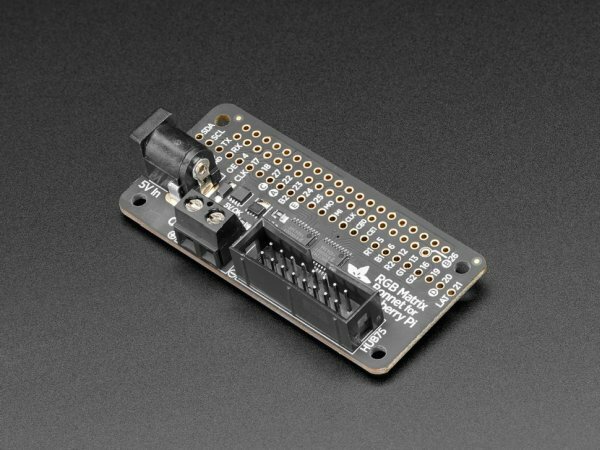 Adafruit has announced the arrival of its RGB Matrix control board for the Raspberry Pi called the Adafruit RGB Matrix Bonnet. The Matrix Bonnet allows one to use the popular Raspberry Pi to control RGB Matrics displays to create a colorful scrolling display, view short videos, and for showing animations. The matrix board plugs easily into the Pi and works on any Raspberry Pi with a 40-pin GPIO header – Zero, Zero W/WH, Model A+, B+, Pi 2 and Pi 3. If you still use the old model 26-pin boards like the Model A or Model B, unfortunately, the bonnet can’t plug into them, and you will need the newer boards. The Matrix control board can work with any 16 x 32, 32 x 32 or 32 x 64 RGB LED Matrices with HUB75 connections. It is also possible to use the bonnet board with 64 x 64 matrix display by doing some hardware hacking – soldering a small jumper on the PCB. And yes, you can get more displays by chaining multiple matrices together for a bigger display. Chaining numerous displays together will also cause some extra workload on the Raspberry Pi itself. The bonnet board is quite rugged and comes with an inbuilt power protection circuitry to protect the board from short circuits, over and under-voltages. It has onboard level shifters to convert the RasPi’s 3.3V to 5.0V logic which will create a glitch-free matrix driving for 5V logic RGB Matrix display. It also comes fully assembled and no need for any extra soldering work.